Robert Baden-Powell returned from the Second Boer War a national hero. As well as being a career soldier he was also an established author. One of his most successful books was a military manual “Aids to Scouting” which contained training exercises for military scouts. This book developed an unexpected audience amongst boys and youth groups who were mimicking the exercises to learn observation and tracking skills. A pocket size manual to improving military skills. Edwardian society was plagued by the thought that Britain was not developing useful citizens. There was a concern that many people were physically weak due to a lack of understanding about nutrition and health and did not possess useful skills. Baden-Powell would have witnessed some of these issues first hand through the poor quality of recruits who joined the Army. There was an appetite for schemes that would help address these issues. Baden-Powell felt that given the right training young people could start to play an active role in their community from an early age and this training would have long term benefits in supporting employment and productivity. He had witnessed first-hand the role young boys “the Mafeking Cadets” had played during the town’s siege (Second Boer War) as they took on non-combative roles including stretcher bearers and messengers. 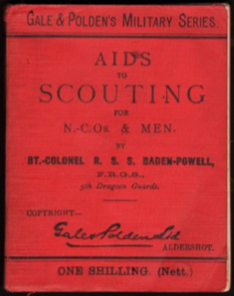 Baden-Powell was convinced by friends; including his publisher Cyril Arthur Pearson and the founder of the Boys Brigade, Sir William Alexander Smith, to create a youth focused version of the book. He started by creating a draft of his new book which swapped the military focus for adventure, exploration and survival skills. It was decided to test the ideas by running an experimental camp for a selection of boys. 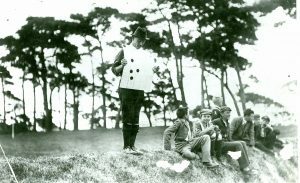 On the 1 August 1907 twenty boys were encamped on Brownsea Island in Poole Harbour to participate in an experimental project. Baden-Powell wanted to see if his proposed activities would appeal to a broad range of young people and so he recruited ten boys from a range of public schools and ten members of local Boys Brigades branches in Bournemouth and Poole. The boys were aged 10 to 16 years old, they were divided into four patrols; wolves, bulls, curlews and ravens, four of the older boys were given the rank of Patrol Leader. There was one more child in attendance, Donald Baden-Powell, nephew to Robert, aged 9 years old he was too young to officially join in so he served as Baden-Powell’s assistant and orderly. 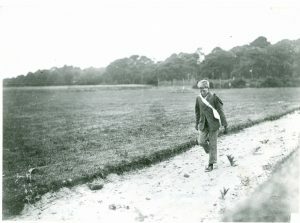 To support Baden-Powell with running the camp were Boys Brigade Captain George Walter Green and Baden-Powell’s friend Kenneth McLaren, with whom he’d served in the Army. 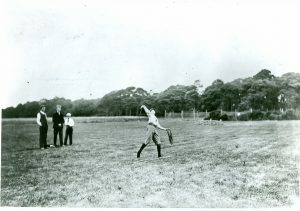 Percy Everett from Pearson’s publishers also attended for a day to observe the activities, he would go on to be Deputy Chief Scout. 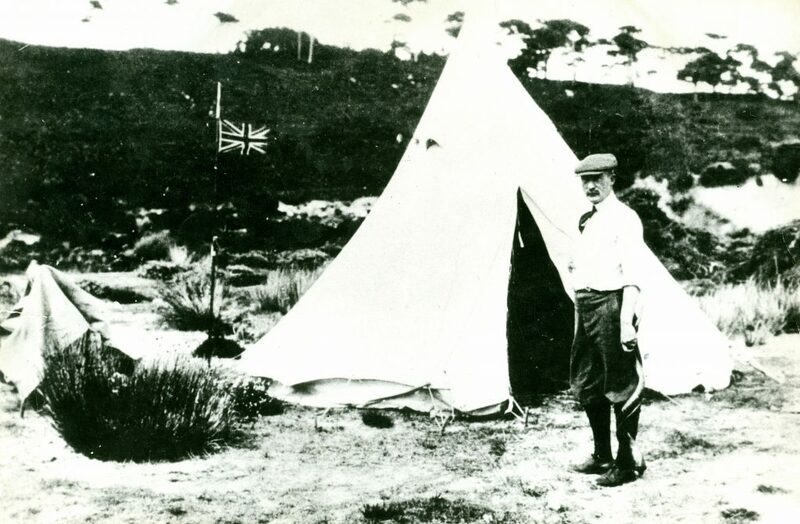 Robert Baden-Powell at the Brownsea Island pilot Scout Camp, 1907. He is holding the Kudu Horn he used to call the boys to the activities. The boys were given shoulder knots of coloured ribbon to wear to mark their patrol and triangular pennants showing an image of their patrol animal. These would later become of standard Scouting uniform and kit. Patrol Leaders were given a white fleur-de-lys to attach to their hats to show their rank. Another item from Brownsea Island that would go on to become a Scouting icon is the Kudu Horn (made from antelope horn and brought back from South Africa by Baden-Powell). Producing a low deep noise that travels well over long distances it was perfect to call the boys to start activities. It was later used at Gilwell Park during leader training courses. Robert Baden-Powell’s kudu horn brought back from Africa and used at the Brownsea Island camp and to summon participants to the start of Wood Badge Courses. Over the week the group tried out various activities. These included: fire-lighting, navigation, observation and tracking, cooking, life-saving and boat management. Games – a sports day was held during the Camp. Learning how to throw a life saving rescue line. Preparing for a game with Baden-Powell giving instructions. An observation activity called “old spotty face”. The Brownsea Island Camp is often called the first Scout Camp and Baden-Powell referred to it as a Scout Camp. 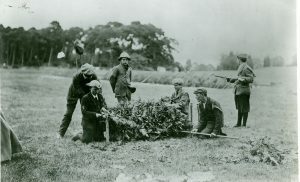 This is sometimes contentious as the boys weren’t Scouts, they had not made their promise, but they were scouting by trialling the activity programme. The response to the activities was sufficiently encouraging for Baden-Powell and his publishers to push forward with finishing the book. 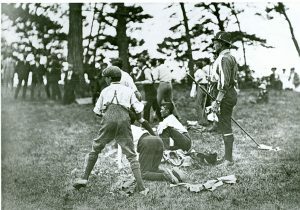 Baden-Powell took what he had learnt from the camp and spent the next few months writing “Scouting for Boys” with the plan that it would provide a tailored training programme for use by other organisations. 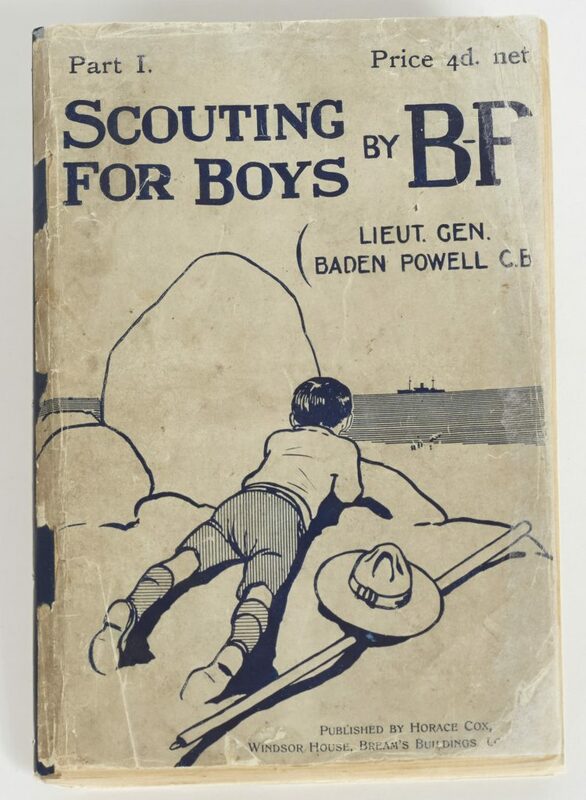 Initially published in January 1908 as a series of six booklets “Scouting for Boys” was supported by a lecture tour given by Baden-Powell. By the end of the month the response to the book and lectures was so great Baden-Powell became convinced of the need for a separate organisation dedicated to delivering the activity programme. An announcement was made to this effect at a YMCA HQ in Birkenhead, the Boy Scouts were born, within two years there would be over 100,000 Scouts in the UK. The first part of Scouting for Boys published January 1908. We know some of the twenty boys who had attended the camp took up Scouting following the publication of “Scouting for Boys”. The boys were of the generation whose lives would be swept up by the First World War. Of the 19 boys who were still alive in 1914 five died during the War and a sixth died prematurely due to the effects of gas poisoning. 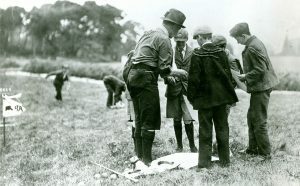 Various reunions were held for the Brownsea boys including one to mark Scouting’s 21st birthday at the “Coming of Age” World Scout Jamboree held in Birkenhead in 1929.